In the cooling-dominated Southwest, it is crucial to reduce residential A/C, which also drives summer peak demand. The added electricity to meet this summer afternoon demand is drawn from peaker plants that are typically among the most expensive and polluting per kW generated. Reducing and/or shifting A/C to lower-demand periods of the day could eliminate summer peak demand, which would reduce the need for peaker plants, reduce energy costs and pollution, simplify grid management, and increase grid stability. A strategy to achieve these benefits is to flatten the peak load by both reducing cooling requirements and moving the mechanical A/C to night and morning hours, when demand is low and compressor-based A/C is most efficient. Employing this strategy has the potential to reduce both total kWh usage and peak kW demand. Working under the DOE Building America program, the ConSol-led Building Industry Research Alliance (BIRA) team assisted Clarum Homes in the design and construction of three homes with identical floor plans but different wall systems and mechanical systems in Borrego Springs, California. (The authors work for ConSol.) Clarum’s main objective was to find the best solution to building comfortable, cost-effective, super-energy-efficient homes with 90% reduced cooling requirements in the hot-dry climate of the American Southwest. One of the Building America objectives was to determine the impact of the three different wall systems in these homes on summer peak demand. The three different wall systems in question were (1) 2 × 6, 16- inches OC, wood-framed walls, insulated with Icynene foam; (2) structural insulated panels (SIPs); and (3) insulated concrete mass walls. The homes all have exposed, slab-on-grade foundations. All the exposed concrete slabs were dyed and textured, but they were not covered with any flooring that would reduce their thermal mass. The homes also had different cooling systems. These cooling systems are discussed in other reports (see “For More Information”). The experiment involved precooling the homes to 72°F during night and morning off-peak hours, from midnight to noon, and then letting them coast through the peak hours of the afternoon when electricity is most expensive by setting up the thermostats to 80°F from noon to midnight. The “coast” period was the period from noon to the moment when the indoor temperature exceeded the 80°F set point. The 80°F set point was chosen as being a comfortable afternoon indoor temperature when outdoor temperatures exceed 100°F. The three houses in this study are located in Borrego Springs, a desert area 90 miles northeast of San Diego, California. Borrego Springs is located in California climate zone 15 and has approximately 1,100 heating degree-days (HDDs) and 3,800 cooling degree-days (CDDs) per year. Climate zone 15 is an extreme hot-dry climate zone, with a four- to six-week period of high humidity in late summer. The results of this project should be applicable to other new homes that will be built in similar hot-dry climates in the Southwest. Each home has 1,920 square feet of conditioned floor area. The three homes have identical floor plans, shown in Figure 1. The homes are identified both by wall construction and by the names of the streets on which they are located. The homes do not all face in the same direction. Two of the homes (East Star, 2 × 6 wood-framed walls; and Broken Arrow, SIP walls) face 30° east of south. Country Club, (insulated-mass walls) faces due west. The specific structure of the insulated-mass walls was DOW T-Mass; these factory-fabricated walls consist of 4 inches of DOW Styrofoam sandwiched between 2 inches of exterior concrete and 4 inches of interior concrete. (DOW no longer manufactures this product, but insulated concrete forms are available from other sources.) The orientation plays an important role in optimizing the capabilities of the PV systems, but it has little effect on the performance of the wall systems in these homes, because of the large roof overhangs. In addition to having identical floor plans, the homes have the same energy features, except for the wall systems and the cooling systems. 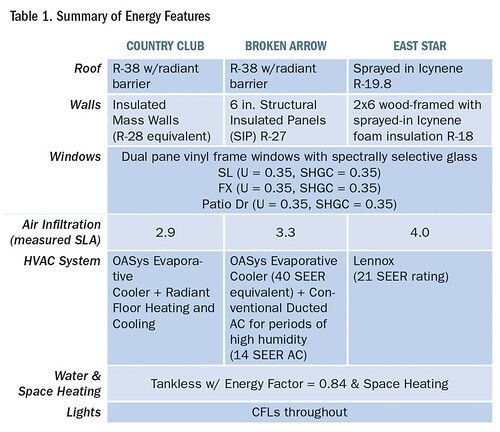 Table 1 lists all of the energy features for the three homes. Over a period of two years, the Building America consortium BIRA, led by ConSol, with the assistance of the National Renewable Energy Lab (NREL) and Davis Energy Group (DEG), conducted several experiments in the homes. The purpose of this research was to evaluate each wall system in terms of costs, buildability, energy savings, and peak energy use reduction. All three homes were instrumented for comprehensive measurement, analysis, and evaluation of the wall systems, cooling systems, electricity demand and use, and environmental conditions. Sensors were installed in the walls of all three homes in the interior, on the exterior, and in the middle of the walls to monitor temperatures and resulting heat flows through the walls. This article focuses on reduction of peak cooling demand in each of the three different wall systems, by comparing A/C coast periods, cooling energy use, and construction costs. The results of the peak-reduction control strategy were compared in the three homes by measuring the time each home took to go from the precooled temperature of 72°F to the setup temperature of 80°F. This time was defined as the coast period. This provided a direct comparison of the degree to which each of the wall systems reduced summer peak electricity demand, (measured in kW) through its space-cooling effect on one of the three homes—each of which had moderate thermal mass from the exposed-slab floor. This approach avoided complications that would have arisen due to the different cooling systems in the three homes if actual electricity demand (measured in kW) had been used to determine peak reduction. In addition to evaluating peak reduction, this study compared energy usage (measured in kWh) under the peak-reduction control strategy with energy usage under a more-typical thermostat control strategy, a constant 78°F cooling set point. This comparison of energy use during the precooling, peak-reduction days to energy use for the constant 78°F days was done to determine whether the precooling approach reduced peak use—at the cost of higher kWh. Of the three homes, the one with the insulated-mass wall system provided the longest coast period, with SIPs as a close second. Not only did the home with the insulated-mass wall system coast for 12 hours, but indoor air temperature increased by only 3.5°F during that time. During this time the cooling equipment was dormant, because the house had been precooled to 72°F, and the home’s thermal mass kept the indoor temperature below the cooling set point of 80°F. The SIP wall system performed well, but not as well as the insulated-mass wall system. During the 12-hour coast period, the indoor temperature in the SIP house rose 8°F from the precooled 72°F to the set point 80°F, in 10 hours. The 2 × 6 wood-framed wall system performed the worst. Indoor temperature in this home rose 8°F—over a period of only 4 hours. All three homes performed better than would most standard wood-framed homes in California—that is, they coasted for several hours during peak summer conditions with high outdoor temperatures of over 100°F—because of the exposed mass in the floors, and the fact that they were well air sealed and insulated. The home with the insulated-mass wall system performed the best in this experiment because it was the one with the highest thermal mass. During the night and morning hours, the A/C system cooled the indoors, and this in turn cooled the thermal mass. Then, during the hottest part of the day—the peak-demand period—the thermal mass absorbed heat, allowing the house to heat up much more slowly than a house with little or no thermal mass would have done. In areas with large diurnal temperature swings during the summer—cool nights and hot days, such as occur in parts of California’s Central Valley—cooling the mass by bringing in outdoor air during the night should make the precooling/coast control strategy very cost-effective. It would not be cost-effective to use outside air for night cooling during the summer in Borrego Springs, because Borrego Springs does not experience temperature swings of this kind during the summer. However, this is a good approach for the swing seasons in Borrego Springs. In terms of A/C peak, the house with insulated-mass walls and the SIP house both had zero cooling-electricity demand during time periods that included, but were longer than, typical utility peak periods, typically extended from midafternoon to early evening—roughly from 4 pm to 7 pm. These extensive zero-demand periods occurred because the A/C remained dormant from the noon thermostat setup until 10 pm (for the SIPS house) or midnight (for the house with insulated-mass walls). However, the 2 × 6 wood-framed house required cooling from the A/C system around 4 pm, because the indoor temperature exceeded the 80°F thermostat set point by that time. The precooling results are detailed in Table 2. 24 hours. 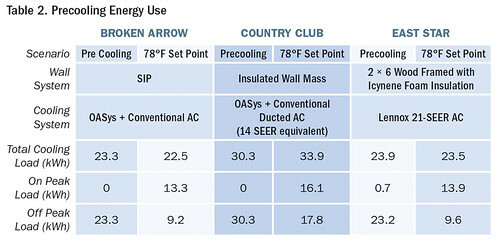 As shown in Table 2, the two control strategies used essentially the same amount of energy, measured as total cooling load, expressed in kWh. 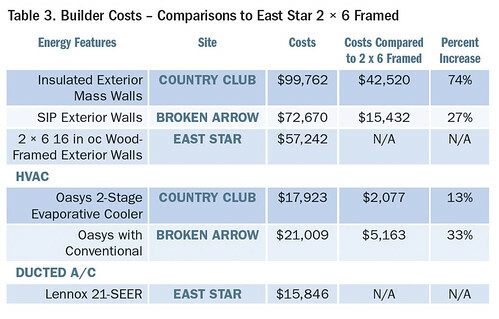 The costs of the three different wall systems are listed in Table 3. The incremental costs incurred by Clarum for the insulated-mass walls and the SIPs walls were roughly 75% and 27% more, respectively, than the incremental costs incurred for the 2 x 6 wood-framed walls. However, we anticipate that the incremental costs for the alternative wall systems, if used in volume (for example, in a subdivision or community), would be substantially lower, as is the case with virtually any construction product used in volume. There might also be cost savings due to construction-time savings, or to reduced loan-carrying costs because of anticipated energy cost savings. We did not measure or estimate these savings in this analysis. Clarum Homes chose to use the SIPs wall system in future construction because, in conjunction with the mass from the floors, it produced a long coast period (almost 12 hours) and cost 48% less than the insulated-mass walls. Steve Vang, formerly with ConSol, is a Demand Side Analyst at SMUD, and Rob Hammon is principal of ConSol, an energy efficiency consulting company serving builders, headquartered in Stockton, California. For more information about the cooling systems in the homes in the peak reduction study, go to www.bira.ws/publications.php and download the report Advanced Systems Research: Final Report. Discuss this article in the Best Practices (Residential) and HVAC groups on Home Energy Pros!